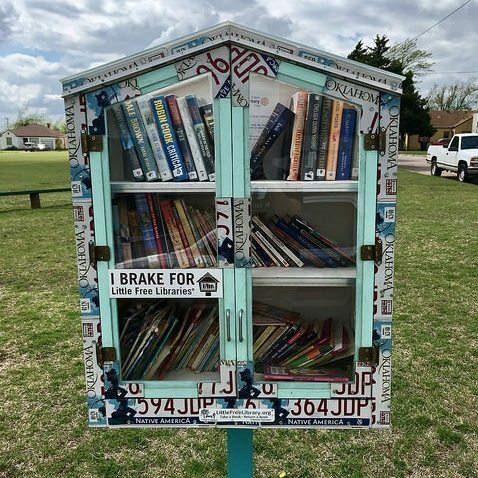 “Little Free Library in El Reno, OK.” Credit: Slinkstercat. Little Free Libraries is under attack this week again after a study was published that questioned the Wisconsin-based nonprofit organization’s impact and overhead. To be clear, the nonprofit is no bloated corporation—on its 2015 IRS Form 990, Little Free Library reported about $729,000 in revenue, including $339,000 in registration fees. It has registered more than 50,000 Little Free Libraries across the country and more recently, the world. Registration costs between $42 and $89 and includes a charter sign and a place on the official world map. The researchers found that they appear mostly in wealthy, gentrified neighborhoods where predominantly white residents are likely to possess university degrees and, most interestingly, where public libraries already exist. This challenges the notion that LFLs can somehow combat “book deserts,” as its website asserts. In reality, it’s feeding books to a neighborhood already fairly well steeped in good literature. Still, a study that criticizes Little Free Libraries as representing “the corporatization of literary philanthropy” naturally put Executive Director Todd Bol on the defensive. In an interview with CBC Radio in Canada, he took exception to the study’s theory that an increase in Little Free Libraries could decrease municipal support for traditional libraries. I say that’s horrible. We support libraries probably as much, if not more, than anybody else. […] We see ourselves as like a branch of a branch that celebrates libraries and celebrates communities. As far as we’re concerned, libraries are the great last bastion of community and community coming together. Anything we can do to encourage the public libraries…is big for us. And if anybody ever used the little teeny library with 20 or 30 books in it to compare us to the big library and say that they shouldn’t have that, that seems absurd. What we do with our money is that we put all the money that’s left over after expenses into programming, trying to expand. We’re 14 people in Hudson, Wisconsin that have made a pretty solid, positive impact around the world by getting book exchanges throughout there. What we do is try to encourage, as much as we can, people to read and come together. We donate libraries all the time to police departments, fire departments, schools. We do all kinds of good things all around the place.